Our hotel comprises a total of 64 rooms of which 2 are suites. Amongst the hotel's facilities count a roof garden bar and a conference room capacity of up to 80 persons. The restaurant offers a large range of Italian and international cuisine, as well as lunch and evening meals. During the summer, guests are able to enjoy a view over the city from the roof garden bar and at dinner from the 5th floor. Guests are welcomed in a stunning atmosphere, while enjoying a stunning panoramic view and sipping a special cocktail. The DONNA LAURA PALACE is a Tourist, Business hotel. Located in Within City area..
Descriptionclass="small" style="text-align: justify; font-size:11px;">Our hotel comprises a total of 64 rooms of which 2 are suites. 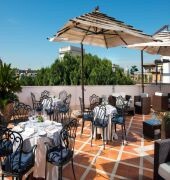 Amongst the hotel's facilities count a roof garden bar and a conference room capacity of up to 80 persons. The restaurant offers a large range of Italian and international cuisine, as well as lunch and evening meals. During the summer, guests are able to enjoy a view over the city from the roof garden bar and at dinner from the 5th floor. Guests are welcomed in a stunning atmosphere, while enjoying a stunning panoramic view and sipping a special cocktail. Besides the fact that metro is 10 minutes walking from the hotel, all experiences we had were very good. The rooms are very clean and maintained, staff are very nice and helpful, food is good and fresh. 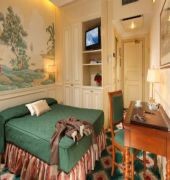 Durrounding is classic Rome and so is the design of the hotel - from the paintings on the wall to the shower and bath knobs. This hotel certainly deserves its 4 stars! I would like to thank you for having chosen to stay at Donna Laura Palace during your recent visit to Rome and also for having taken the time to share your experience. I appreciated you sharing your positive ratings regarding your overall experience and I am pleased to know that you found everything to your complete satisfaction, especially the location, the standards of your room and breakfast and service of our staff. We do appreciate your feedback in order to improve our services in the next future! I look forward to welcoming you back to our hotel , hoping that the future stores many more opportunities for you to stay with us. Greetings from the Eternal City! A very nice hotel. The help me a lot all the time of my visit. Very clean rooms, and beautiful design remembers you all the time that you are in Rome. Very friendly atmosphere. Grazie!! ! â˜º. 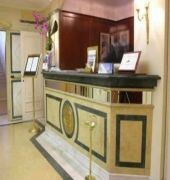 First and foremost thank you for your 5-star review and to have chosen Donna Laura Palace for your stay in Rome. I am delighted to read such a gleaming report of our Hotel and very happy to read that you had a great time with us. We are so happy reading you were so satisfied ! The feedback we receive from valued guests like yourself, enables us to keep up the good work.We very much hope to have the opportunity to welcome you back to htl Donna Laura Palace on your next visit to Rome! - Rude customer service at check-in. I felt I was stepping on someoneâ€™s private room without knocking, thatâ€™s the look on the clerk at the check-in desk. I didnâ€™t feel welcome at all. Had I not done the booking beforehand, I wouldâ€™ve stepped right out and gone some place else. - I was charged 8 euros for one bottle of water which should have been 2,50 euros, from the minibar. When I confronted the customer service, they simply said sorry canâ€™t help. They said I drank â€˜somethingâ€™ but they didnâ€™t know what it was. I told them I drank a bottle of water as I was thirsty, the price list was saying it was 2,50 Euros. They said sorry you must have drank alcohol. I said to her, lady, I donâ€™t consume alcohol. Havenâ€™t consumed any in 5 years. She said sorry we canâ€™t do anything. So basically I was left helpless so I just left the building as I was in a hurry to catch my plane. - Noise coming from construction or something banging in the upper floors always woke me up at 7-8 am. - I put the sticker â€˜do not disturbâ€™ in the door handle and went in for a shower. Before even finishing some staff member let himself in and I got really scared. I had to quickly put a t-shirt on and show him out. This happened several times during my stay. - City tax charged at the end of stay, not convenient. - I asked to split my bill about the city tax, for my job, they needed it. Before even finishing my words, the customer service said sorry, no. We canâ€™t help. What is printed is already gone. We canâ€™t make any changes. The money they stole is not much but, really, this ruins the trip. thank you for your comments, in which you drew our attention to your experience while guest at our Hotel . First of all we do apologize and we are of course very disheartened that your stay was not as positive as the ones of other guests who reported their comments on this site. Our aim is that every guest who visits us enjoys their stay as fully and as richly as possible. We regret to read that you were not fully satisfied with your stay with us because we constantly work to make our clients feel welcome and towards meeting their expectations hence we regret not having succeded at this time. We regret your stay with us was perhaps not what it should have been. I felt like the poor Neighbout as next door was the number one restaurant in Rome. Having nag said that being were we were was quite Not noisy and so we liked as a family. I would say that this place is good value but one could get more central for less. We wound come back. I am delighted to read such a gleaming report of our Hotel, staff, facilities. I have shared your review with our whole team. Once again, we appreciate you taking the time to share your comments with us and we do hope to have the opportunity to welcome you back to our Donna Laura Palace in the future. Well kept and clean. Front desk staff was a bit difficult to deal with, our tour manager needed to intervene to ensure that my friend and I got moved to a room with 2 beds as we had originally reserved. After they said they were full and could make nochsnges, another room miraculously became available when their mistake was pointed out. Thank goodness for our tour mgr! 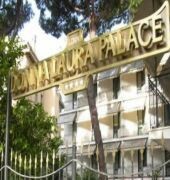 first and foremost we do thank you for choosing the Donna Laura Palace for your stay in Rome. I've read your experience and apologize for miseundersting about the tipology of the room reserved to your friend.